What Do Non-Traditional Students Want, Anyway? Non-traditional students expect flexibility from their universities, both inside and outside the classroom. But what does this really mean? In short, it means that today’s students see themselves as the masters of their educational experience. They’re going to enroll in whatever course or program meets their unique scheduling needs and career goals. Institutions can’t simply offer a strict set of defined programs and assume they will meet the needs of their students. This video explains how, instead, institutions need to create as many pathways as they can to allow students to access to their network of content. Non-traditional students want a personalized and customized higher education experience that’s responsive to their unique needs. It’s up to colleges and universities to provide that. Three Trends Worth Watching for Continuing Education Leaders: In this article for The EvoLLLution, University of Wisconsin Colleges and Extension Chancellor Cathy Sandeen breaks down the three most significant changes in the way students are demanding and consuming higher education, paying special attention to their need for greater flexibility and unbundling. She also shares insights into what continuing education leaders—and institutional leaders more generally—need to do to respond and adapt to these shifts. 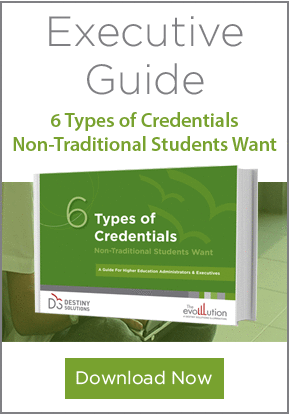 Six Types of Credentials Non-Traditional Students Want: We’re way past the era of the “degree-and-done” student. Today’s learners have a wide range of goals and are looking for a postsecondary option that specifically addresses their needs. This executive guide by Destiny Solutions provides some insights into the types of credentials that are top-of-mind for today’s students. Honing a Spectrum of Learner Access: In this EvoLLLution article by Dave King, associate provost of outreach and engagement at Oregon State University, he outlines the importance of making sure an institution has multiple programs available across every subject area for every prospective student. The only way this is truly feasible, according to King, is to remove internal silos that hamper collaboration and ultimately stymie unbundling and flexibility. The Great Unbundling of Higher Education: This article by Ryan Craig of Eduventures delves into the massive impact unbundling has had on industries across the consumer space and shares his insights on how unbundling of services, coupled with the demand for just-in-time education, is transforming demand for higher education. At its core, delivering this level of flexibility means shifting from an institution-centric mindset to a student-centric mindset. It means designing a college experience that fits expectations of students rather than trying to push students into boxes the college itself designed.